I wasn’t sure if I had slept well or not. The thin mattresses were not the most comfortable, and as usual there was a snorer or two, probably I was snoring as well. Maybe I should have gone to the mediation session held the previous night. The albergue provided a good breakfast and great coffee so I soon felt better. Some days are happy and rewarding and some are not so. I already felt that today would be sad for some reason. 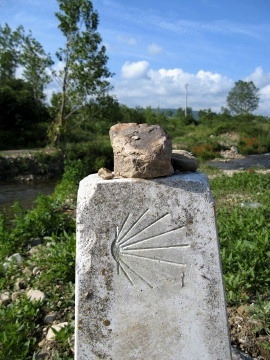 The thought of facing another slog along the Camino was sometimes a difficult one, especially if the weather was bad. As I set off the mood changed. 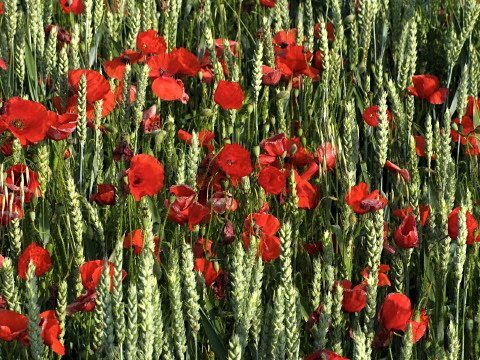 The light was bright and fresh, and the country beautiful and covered with wheat fields. It was amazing how the mood could change after just a few kilometres of walking. Right on the edge of Granon was the border with Castilla y Leon. 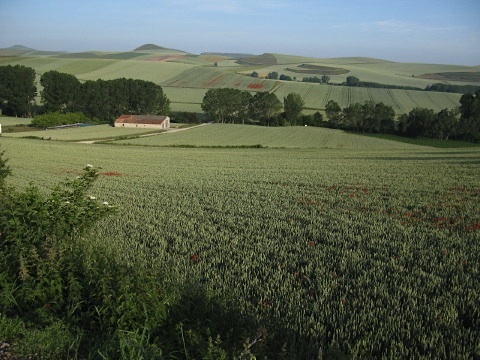 I was leaving La Rioja state and the land had changed much since arriving in Spain. The way ahead would be flatter and by all accounts much hotter and dryer. 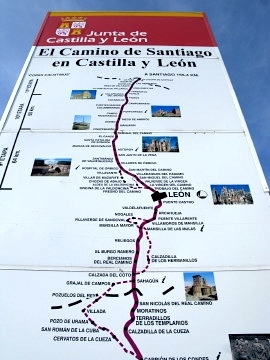 Not far after the sign was the village of Redecilla del Camino with its smart regional tourist office at the entrance to the town. I spent a few minutes browsing through the brochures and books about the Camino. There was a small booklet for pilgrims that had some interesting historical information. Apart from that the town was deserted and consisted on only one main street. It felt lonely. I was happy at the village of Villamayor del Rio where I found a collection of tables and chairs in the square near the fountain. There were two vending machines containing cold drinks. Also a sign for a shop that I could not find. Eventually I knocked on a door and was lead into what looked like a spare room in a house. There were many basic food items, and supplies for pilgrims. The two nectarines I bought were the best I had ever tasted! The next town of Belorado was larger and being 2pm it was deserted. The heat was intense and I was feeling drained and a bit empty. Maybe I did not sleep well last night after all. Yesterday had been my 40th day of walking since Le Puy en Velay. One pilgrim, an English girl called Rose, commented that maybe it had been my 40 days and 40 nights in the wilderness. The comment gave me a lot to think about. The mood improved again a short time later as I walked with two Norwegian guys. They were always laughing and joking and it raised the spirits. They continued on at Tosantos. My day’s walk had consisted of just over 20 kilometres – I felt that I had walked 40! It took a while to find the Albergue San Francisco de Asis. It was another ‘donativo’ with thin mattresses on the upper floor. The building itself was very old and a fascinating place. The atmosphere was cold however, and the evening was also becoming chilled. We all got together to cook the evening meal and to prepare the table. The meal, cooked by a Hector, a young Spaniard, was basic but good. I didn’t stay up late, the sadness returned as the prospect of a good night’s sleep on the thin mattresses was not certain. Other pilgrims had taken mats at the other end of the dormitory. Maybe it was me who snored. Maybe tomorrow would be a better day. This entry was posted in From the Way and tagged Granon, Tosantos, Via Frances, Way of Saint James, Week Six. Bookmark the permalink. Post a comment or leave a trackback: Trackback URL.